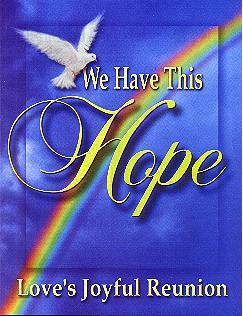 The hope of the second coming of Jesus Christ has inspired Christians since the days of the apostles. This magazine briefly reviews the second advent hope through the ages and reflects on the Bible prophecies relating to what will be happening just before Christ comes the second time. There are three chapters dealing with Bible truth and current misunderstandings regarding Jesus' return. If you have a United States or Canadian (may not always be available in Canada) post office address, Project Restore will be happy to send a complimentary copy of this magazine to you (limit = one copy per person or address). Please use this form to make a request. If you don't have a U.S. or Canadian address (or even if you do), we invite you to read We Have This Hope online (just click on one of the article titles below). 1. From Tragedy to TriumphA brief scan of the origin of evil and God's solution. 3. Brilliant Rays of Hope The Protestant Reformation. 4. The Great Awakening A "second coming" revival in the 1800's. 5. The Third Angel A divine message warning against the mark of the beast. 7. The Certainty of Salvation How to receive Christ and continue in Him. 8. Some Bright Golden Morning The hope of a resurrection to unending life. 9. The Coming Conflict Growing religious conflict in the time of nearness to Jesus' coming. 10. The Final Crisis God's people are protected in the last great turmoil. 11. Love's Joyful Reunion Final deliverance of God's people and the millennium begins. 12. The Bible Says Many of the Bible verses about Christ's second coming. 13. The Secret of the Rapture A discussion from the Bible of a popular idea about Jesus' coming. 14. Your Questions Answered Bible answers to some second coming misunderstandings. 15. Eternal Joy A glimpse of the glories of the eternal home of those who choose Jesus.